To survive as long as he did in the major leagues as a utility player is a testament to Bergman and his approach to the game. During his 14 full seasons in the majors, he averaged only 189 at-bats per year. He was a career .258 hitter who never had more than seven home runs or 44 runs batted in in a single season. But Bergman accepted his fate as a part-timer early in his major-league career. At each stop along the way, like an apprentice aspiring for a journeyman’s card, he learned what he could from some of the best managers in the game. Bergman prepared himself for whatever the team needed from him, whether it was as a pinch-hitter or a late-inning defensive replacement. David Bruce Bergman was born to Donald Bergman, an electrician, and Gloria Bergman in Evanston, Illinois, on June 6, 1953, the second oldest of five children. Growing up in the near north suburbs of Chicago, Bergman was a Cubs fan in the era of Ernie Banks, Billy Williams, and Ron Santo. Bergman turned down his hometown Cubs and elected to attend Illinois State University. Recalling those events in 2001, Bergman said, “It was a tough decision not to sign! I truly felt a college degree was more important.” He went on to play three years for the Illinois State Redbirds with a career .365 average while becoming the school’s first Division I All-American. Bergman was also a batting champion, with a .341 average while playing for Chatham in the Cape Cod League for college players in the summer of 1973. In June 1974, after his junior year, Bergman was drafted by the New York Yankees in the second round, and turned pro. He adapted well to pro ball playing for Oneonta, where he was the batting champion at .348 and the New York-Penn League Player of the Year. Based upon this impressive debut, in 1975 the Yankees moved him up to Double-A West Haven, but after six weeks he was hitting only .180. In a New York Daily News interview, Bergman said his manager, Pete Ward, told him, “I don’t care if you hit .150, you’re going to be in there every day. I know you can hit.” Bergman responded to this vote of confidence by finishing the season at .311. Once again he was the league batting champion and Player of the Year. After batting .300 in winter ball, Bergman looked forward to spring training in 1976, but soon faced another obstacle to making the Yankees’ roster: his manager, Billy Martin. In 2008 he remembered Martin telling him, “I don’t even know why you are here. You are the worst player I have ever seen in a major-league uniform.” Bergman's fortunes seemed to turn with Martin after participating in a bench-clearing brawl. “He was pulling me off the pile and I turned around to nail him and that’s when I started playing, after that.” Bergman received a lot of playing time because of injuries to the starters. “I was the most valuable player in spring training. I thought I had made the team and that I was going to start in the outfield.” To his surprise, he was sent to Triple-A Syracuse instead. In spite of his disappointment at not making the parent club, Bergman enjoyed a successful summer. He hit .295 with 65 RBIs and the Syracuse Chiefs, under the guidance of manager Bobby Cox, won the postseason Governor’s Cup, the championship trophy of the International League. Also during that summer, Bergman married Cathryn Link, whom he had met in college. His future with the Yankees appeared promising. The team protected him in the November 1976 expansion draft and signed him to a two-year contract. But the following spring, unable to land a roster spot on the talented and eventual world championship 1977 team, he was again sent to Syracuse. In June Bergman’s career took an abrupt turn when he became “the player to be named later” in a trade with Houston in which the Yankees received Cliff Johnson. Bergman was unable to clear waivers and was the center of a controversy over where he should finish the season. He was officially still the property of the Yankees, but unofficially committed to Houston. The Astros wanted him to report to their farm club in Charleston, West Virginia, but he wanted to remain in Syracuse. His wish was granted, and he remained at Syracuse, finishing the year with a .312 average, 16 home runs, and 29 stolen bases. Still coveted by the Yankees, Dave was a September call-up. He remembered, “Billy Martin told me, ‘You are not going anywhere.’ There was a rumor that Cliff Johnson was damaged goods.” On September 25 in Toronto, Bergman got his first major-league hit, a single off Mike Willis in the ninth inning of a 15-0 Yankees victory after replacing Johnson at first in the seventh inning. The hit broke his 0-for-18 streak dating back to 1975. In 1978 Dave got off to a slow start with the Astros, hitting .143 while playing sparingly at the All-Star break. After the All-Star Game, over a span of 26 games, he was inserted into the starting lineup, almost always as a left fielder against right-handed pitching. Bergman responded well, hitting .313 with 16 walks. He finished the season at .231 with only 186 plate appearances in 104 games. In 1978 he also completed the coursework for his business degree and graduated from Illinois State. At the end of spring training in 1979 Bergman, who had a remaining option, was sent down to Charleston. “I was very disappointed,” he said. “I still felt at that time I could compete at the major league level.” Jim Beauchamp, the Charleston manager, was supportive of Bergman. “He was determined to work with me and get me back to the big leagues. ... It seemed like the harder I worked, the worse I got. I had developed a hitch in my swing from trying to hit the ball to left field in Houston.” Beauchamp brought in a hitting instructor to work with Bergman in the second half of the season and got his batting average up to .280 by the end of the International League season. Houston was in the middle of a pennant race when he rejoined the team that September. Bergman did his part in the stretch drive, going 6-for-15, but the Astros finished a game and a half behind the Reds. On September 26, he hit his first major-league home run, a pinch-hit shot off Phil Niekro, who notched the win and evened his record at 20-20. Phil's brother Joe took the loss for the Astros, putting him at 20-11. The following spring Bergman made the Houston roster and at the age of 26 he was in the big leagues to stay for the next 13 seasons. The 1980 season was a memorable one for the Astros franchise. Houston battled for first place all season long. With only three games to play in the last series of the season, against Los Angeles, Houston held a three-game lead over the Dodgers, so needed only to win one game to clinch the National League West Division. They lost all three by one run, but prevailed 7-1 over the Dodgers in a one-game playoff. Bergman appeared in 90 games, often as a late-inning defensive replacement, with only 78 at-bats and a .256 average. He did make his contribution when called upon, including going 10-for-23 (.435) in August and September. Many consider the playoff series between Houston and Philadelphia to be the best ever. It went the full five games, with the last four going into extra innings. In Game Two, Bergman's two-run triple off Kevin Saucier highlighted a four-run 10th-inning that sealed the victory for the Astros. He told the Syracuse Herald, “I’m Dave Bergman, so I figured (Saucier) was going to challenge me. He came in with a fastball and I came through this time.” Ultimately the Phils won in the series, winning Game Five, 8-7. In his three seasons at San Francisco Bergman averaged 135 at-bats and 84 games, playing mostly at first base with some time in the outfield as well as pinch-hitting. His batting average improved each year, with his best year being 1983, when he finished at .286. He started slowly that year but warmed up at the plate when he began to play more regularly in August after an injury to Champ Summers. He hit .392 in August and September. On August 30 Bergman had two home runs and five RBIs in a 13-2 win over Montreal. Frank Robinson told The Sporting News, “Bergie is our secret weapon. He’s done a fine job without complaining about his situation. He’s a professional and he’s had a great attitude on this club.” He also had great success as a pinch-hitter in 1983, ranking third in the National League with a .355 average. Despite his success in 1983, on March 24, 1984, Bergman was traded by the Giants to Philadelphia for Alejandro Sanchez, an outfielder. The Phillies immediately sent Bergman and relief pitcher Willie Hernandez to Detroit for catcher-outfielder John Wockenfuss and outfielder Glenn Wilson. Bergman’s mood changed quickly. Upon his arrival with the team, his former Giants teammate Darrell Evans told him, “You are going to be pleasantly surprised. This is going to be a real good team.” After honing his skills for parts of eight seasons in the majors with three clubs, Bergman was ready to apply all he had learned to help his new team. For the Tigers, 1984 was a magical season, and for Bergman it was one of the best in his career. The Tigers roared off to a record start, going 35-5. Bergman found himself playing more regularly. Manager Sparky Anderson inserted him in the starting lineup on Opening Day. He appeared in 31 of those first 40 games, getting his batting average up to.286 through the first 39 of those contests and making some key contributions. 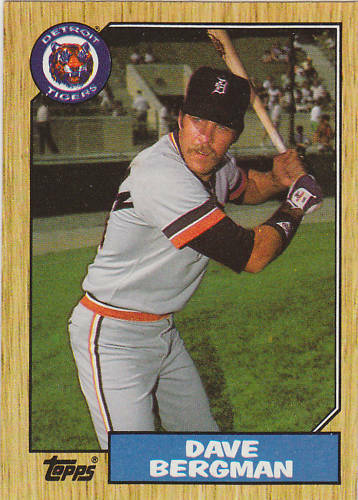 On April 6, his first-inning two-run, two-out single gave the Tigers a three-run lead in what was ultimately a 3-2 win over the Chicago White Sox. On April 24 Bergman had an RBI single and scored the winning run as the Tigers rallied from two runs down in the bottom of the ninth against the Minnesota Twins. On May 11, he had two hits and drove in three runs in an 8-2 victory over California. Against Seattle on May 14, his pinch-hit triple in the eighth inning knocked in the winning run. The triple extended his six-game hitting streak, in which he had gone 11-for-22. Throughout the season Anderson inserted Bergman in the lineup late in games for defensive purposes at first base. In this role he became an important figure in the late innings of Jack Morris’s no-hitter on April 7. In the seventh inning he snared over his left shoulder the hardest-hit ball of the day, a line drive off the bat of Tom Paciorek. Many have speculated that the right-handed Barbaro Garbey, whom Bergman replaced at first base that inning, would have been unable to make the play. In the eighth inning, Dave went to his knees to knock down Jerry Hairston’s hard-hit line drive, tossing the ball to Morris covering first to preserve the no-hitter. The circumstances around Bergman’s memorable June 4 home run contributed to the drama. Detroit’s eight-game lead had shrunk to 4½ as second-place Toronto arrived in town. The Tigers had lost six of their last nine while the Blue Jays had won 10 of their last 12. The Tigers overcame a 3-0 deficit to tie the game in the seventh inning. Facing Roy Lee Jackson in the 10th with two out and two runners on base, Dave worked the count to 3-2. He then fouled off seven pitches in a row. Of that at-bat years later, Bergman told writer George Cantor: “There comes a time in every season when a hitter puts all his mechanics together. That night was it for me.” The eighth pitch was a slider six inches off the ground that Bergman hit into the upper deck in right field for a 6-3 victory. “I don’t have to tell you that it was the biggest thrill of my career,” he said. Fortunes changed in 1985. The Tigers finished in third place, 15 games back behind division-winning Toronto. Bergman suffered a torn elbow muscle in spring training. He returned after arthroscopic elbow surgery, playing in only 69 games and hitting just.179. There was speculation in spring training in 1986 that Bergman was expendable. The Tigers had three left-handed-hitting first basemen on their roster. Nevertheless, Bergman survived the final cuts and in the second game of the season, on April 9, beat Boston with a pinch-single in the bottom of the 10th inning. He finished the year at .231, appearing in 65 games, while Detroit again finished third. One highlight for the season took place on June 17 when Bergman tagged out Alan Wiggins in the third inning of a 6-3 win at Baltimore using the hidden-ball trick. The 1988 season was another exciting one for the aging Tigers. They battled for first place all season. On August 21 they held a four-game lead before experiencing injuries to key players. The team faded and finished second, just a game behind Boston. Bergman hit .323 through August, when he suffered a groin injury. After returning in September Dave batted only .203, but finished at a career-high .294. In 116 games that year with 289 plate appearances he hit in all nine spots in the batting order. At the end of the season the Tigers re-signed Bergman for another two years. On a losing team there was value in having a veteran who remained positive and came to the ballpark every day ready to play. Bergman told the Detroit Free Press, “Win or lose, I’m the same. I keep my mouth shut and play hard.” With Cecil Fielder now playing first base and hitting home runs, Bergman’s playing time in 1990 dropped off. He played in 100 games with 205 at-bats while hitting .278. In his last two seasons, 1991 and 1992, Bergman played sparingly and hit .237 and .232, respectively. After the 1992 season he debated whether to return for another year. The Tigers indicated they did not have a place for him on the team. There were possible opportunities with Minnesota and Atlanta. Dave consulted with Sparky Anderson on his options. Bergman said Anderson told him, “David, you want to walk away from the game rather than the game throwing you away.” In January 1993, at the age of 39, Bergman announced his retirement. While with the Tigers, Bergman made the Detroit area his permanent home. In 1989 he began work as a financial adviser for Sigma Investment Counselors. He helped the firm expand from a managed portfolio of $22 million to more than $500 million 19 years later. Dave was also very active in the Grosse Pointe Baseball Organization, sponsoring four teams. He was elected to the Illinois State University Hall of Fame. Approaching the 25-year reunion of the 1984 Tigers, he resided in Grosse Pointe, Michigan, and was the father of three grown children, Troy, born in 1979; Bria, born in 1982; and Erika, born in 1985 – a year after some of her dad’s greatest accomplishment in a uniform. Bergman died at age 61 on February 2, 2015. Cantor, George. Wire To Wire. Chicago: Triumph Books. 2004. 79-80. Detroit Tigers 1986 Yearbook. Detroit: Detroit Tigers. 1986. Brodsky, Marty. “Bergman Just Doing His Job for Tigers,” Oneonta Daily Star, August 12, 1991. 12. Brown, Clifton. “Bergman Not Ready To Give Up,” Detroit Free Press, April 18, 1987. 1C. Chass, Murray. “Yankees Rookie on Cloud 9,” The New York Times, August 28, 1975. 27. Forman, Ross. “Bergman’s Autograph Collection Includes DiMaggio, Brett, Ryan.” Sports Collectors Digest, February 4, 2000, 106. Gage, Tom, “Bergman is Tigers’ Mr. Cool in Clutch.” The Sporting News, June 18, 1984. 15. Guidi, Gene, “Survivor Bergman, 36, Will Return.” Detroit Free Press, September 9, 1989. 1C. Guidi, Gene. “Bergman Accepts Role.” Detroit Free Press, September 6, 1984. 1D. Guidi, Gene. “Bergman Seeks Return As Tiger Next Season.” Detroit Free Press, September 29, 1992. 4C. Pepe, Phil. “Johnson Out, Bergman In As Yanks Look to Future.” New York Daily News, August 27, 1975. C22. Peters, Nick. “Bench Production A Rare Bright Spot.” The Sporting News, September 12, 1983. 24. Richmond, Milton. “Houston’s ‘A.A’ Popular ... Astros Anonymous.” Syracuse Herald-Journal, October 9, 1990. Shattuck, Harry. “Ex-Yank Bergman Welcomes Change With Astros.” The Sporting News, February 18, 1978. 62. Tingley, Ken. “Bergman Reaches Prime,” Oneonta Daily Star, August 8, 1984. Nechal, Jerry, Interview with Dave Bergman, May 22, 2008. Nechal, Jerry, Interview with George Verber, December 29, 2007.